Tender, bourbon and butter-infused apple slices perfectly compliment this delicious, herb-butter roasted turkey. This is an impressive entrée for holidays and special occasions. For Herb Butter: Combine butter and fresh herbs; set aside. For Turkey: Remove giblets and neck from the cavity of the turkey. Rinse and dry bird. Fold wing tips behind the turkey. Season the cavity with salt and pepper. Starting at the neck end of the turkey, loosen the skin by sliding your fingers underneath it, being careful not to tear it. Slide your hand as far as you can toward the other end of the turkey, separating the skin from the meat. Rub two-thirds of the herb Butter over the entire breast. Tie drumsticks in front. Place the bird on a rack in a roasting pan breast-side up; cover loosely with a foil tent. Place bird in oven and decrease the temperature to 350ºF (175ºC). Bake 3 to 3 1/2 hours. Melt remaining herb butter. 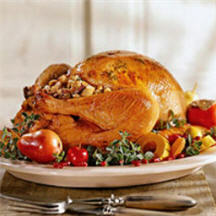 Remove foil tent from turkey during the last 45 minutes of baking and baste once with melted butter. The turkey is done when the thigh meat reaches an internal temperature of 180ºF and the breast meat reaches an internal temperature of 170ºF (80ºC). When the turkey is done, remove from the oven; let stand 30 minutes before carving. For Bourbon Buttered Apple Slices: Heat 1/4 cup butter in large skillet; add shallots, cook uncovered over medium heat for 5 minutes. Add apples, maple syrup and bourbon, simmer uncovered 3 minutes. Add cider and boil over medium-high heat until most of the liquid has evaporated. Reduce heat and stir in remaining butter one tablespoon at a time. Stir in sage, nutmeg and cloves. Serve warm with turkey.